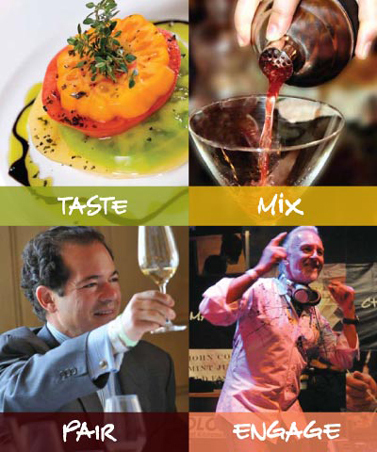 Eat, drink, and mingle with Bay Area’s leading chefs, winemakers, and mixologists at SF CHEFS 2010, THE food party to end all food parties. I don’t know about you but my plan is to get on the treadmill as soon as I finish typing and not get off until August 9th, which kicks off an amazing week jam- packed with EVERYTHING related to delicious food, wine and spirits. * Opening night’s Hog in the Fog, honoring everything piggy. Come see and taste what a cadre of talented chefs can create using a whole roasted Duroc pig as the temptress. I can personally testify as to what Ryan Farr( 4505 Meats) can do with pig and it’s simply magical. The evening will start with a sparkling toast provided by Domaine Chandon followed by pig-nibbles and wine tasting as you tap your trotters to the sounds of the Soul Peppers Band comprised of chefs Joey Altman, Gordon Drysdale, Marc Baum, David Margen, Tony Lufrano, and Jon Otis. *Fork It Over Foodraiser at Union Square, where 25 star chefs will prepare a signature lamb dish for our tasting pleasure. Can’t wait to see what Mourad Lahlou (Aziza), Scott Howard (Brick + Bottle) and Craig Stoll (Delfina) do with Baa-Baa Black Sheep. Wine, cocktails, live music, and a food and wine lover’s silent auction all add to the fun. For the more cerebral foodie there is a full roster of seminars where you can learn everything from “How to make the perfect Margarita” to discovering what celeb-chefs such as Michael Mina and Charles Phan really feel about the evolution of American Cuisine. Wine pairings, dessert tastings, sommelier luncheons, panel discussion, cooking demos, happy hours, pre and post parties round out the week. Tip: In addition to all the big party hoop-lah, there will also be a special SFCHEFS 2010 RESTAURANT WEEK, August 9 to August 15, 2010. Over 60 local restaurants will feature signature three course prix-fixe dinners (a phenomenal deal at either $35 or $50) \ in honor of the big event. Pork will play a starring role although vegetarian options are also available. What: For a complete schedule of events see website. Ticket info: To buy your tickets go to sfchefs2010.